Private companies produce the vaccine, with heavy government subsidies, and then roll it out to the states, often with a strong federal government recommendation to make it legally mandatory for school children. Once the shot reaches doctor’s offices and schools, the manufacturer is shielded from any legal liability for “adverse events.” The federal government also generally dismisses any such reports and refuses to investigate them. It also refuses to do follow-up studies to see if the shot is actually conferring much immunity. All of this is an absolutely shameless example of conflicts of interest, disregard for public safety, and crony medicine at its worst. Yet when challenged by these facts, public health officials in charge of the federal vaccine program may just dismiss critics as “cranks” or “flat-earthers.” Bloomberg News in an editorial parrots the line that vaccines are our only hope for the flu and calls for an even bigger government/ private partnership to develop them. To the contrary, a good start at dealing with this mess would be legislation taking government out of either the vaccine development business or the vaccine approval business and giving parents more choice about what is injected into their children. Julie Gerberding was director of the US Center for Disease Control (CDC) from 2002 to 2009. Researchers in this agency patented the technology underlying what became the Gardasil vaccine for genital warts and then licensed it to the drug company Merck on terms that made the two financial partners. This was not in any way unusual. The US government financially subsidizes and partners with the five leading vaccine makers (GlaxoSmith- Kline, Merck, Novartis, Sanofi Pasteur, and Wyeth) in numerous ways. Critics find this particularly objectionable because the US government then persuades states to make many of the vaccines a legal requirement for school children. In effect, the developer of the vaccine, not a truly independent third party, decides what works, what is safe, and what will be mandated. By that time, the presidential nominating process was underway, and GOP Congresswoman and candidate Michele Bachmann criticized GOP Texas governor Rick Perry for simultaneously taking campaign money from Merck and issuing an executive order mandating the vaccine in his state. Bachmann was then ridiculed, not only by other politicians, but also by the major media for raising the issue, despite the incontrovertible evidence supporting her position. A year earlier, Julie Gerberding, who had brought the Gardasil vaccine to market as head of the CDC, left government to become—what else?—president of Merck Pharmaceutical’s vaccine division, maker of the Gardasil vaccine. This new job also put her directly in charge of Merck’s Measles, Mumps, Rubella (MMR) vaccine, another controversial shot. One of several concerns with MMR, a possible link to autism in children, has led, not to further scientific research, but rather to media controversy, name-calling, and lawsuits. Dr. Andrew Wakefield, who reported the possible link, found himself charged with unethical behavior, his article was repudiated by the publisher, and the doctor’s UK medical license was revoked. Dr. Wakefield subsequently filed suit in the United States, and there is considerable evidence that he is simply a victimn of outraged special interests. Interestingly, Dr. Gerberding was asked on a television show if vaccines in general might cause autism, and did not directly deny it.229 The Italian Health Ministry also conceded in court that the MMR had caused autism in at least one case.230 In addition to Dr. Wakefield’s lawsuit, another, filed by former vaccine researchers at Merck in 2012, and unrelated to autism, charged that the company fabricated trial results for the MMR, in order to bolster claims of effectiveness.231 Merck is the sole supplier of this vaccine which had also been approved and promoted by Julie Gerberding’s CDC. As of 2012, Merck makes all of the 17 vaccines “recommended” for children by the CDC, and 9 out of 10 “recommended” for adults. One of the US government’s favorite vaccines is supposed to prevent flu. 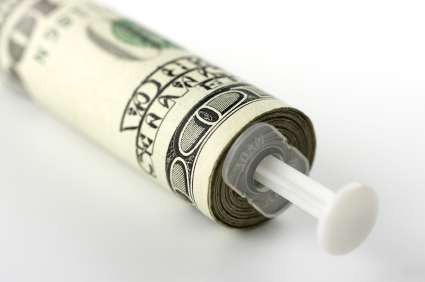 A June 2011 Government Accountability Office report 232 found that the federal departments of Health and Human Services and Defense paid vaccine makers, usually divisions of drug companies, $2.1 billion between August 2004 and March 2011 to subsidize both improved production of the flu vaccine and the development of new versions, including a genetically engineered version utilizing worm viruses and caterpillar ovaries.233 These funds were part of $7.1 billion authorized by Congress in 2005 to prepare for a dangerous flu pandemic, 234 and additional funding of government-vaccine maker “partnerships” has continued ever since. The “partners” include foreign as well as domestic companies, but building a US plant is a pre-condition for participation. Does the flu vaccine work? It is hard to be sure because the government refuses to test people who have been vaccinated. There are reasons to think that whatever immunity it confers is very temporary or weak and that it does not actually prevent much flu. In some years, the vaccine is engineered against the wrong strains of the disease. The US government often mentions “flu deaths” when promoting the vaccine. But, when scrutinized closely, the “flu deaths” appear to be fabricated. Any death associated with respiratory illness is called a “flu death,” even when there is no proof of a flu virus and the death has almost certainly been caused by pneumonia, a different illness more commonly associated with bacteria than viruses. Published research also links the use of stomach acid blockers, a favorite of doctors and a major money maker for Big Pharma, with pneumonia. The problem is that acid in the stomach protects our bodies from pneumonia bugs, and by blocking the acid we put ourselves at risk of many illnesses as well as nutrient deficiencies, especially mineral deficiencies that may lead to weak bones as we age. Is the US flu shot safe? The answer appears to be no. One independent study found that those inoculated with the seasonal flu vaccine had become more likely to be infected by the more dangerous H1N1 flu virus. An H1N1 vaccine has been associated with several problems, including later narcolepsy. 238 In addition, US flu vaccines usually contain mercury as a preservative. Europe does not allow this, but the US government does. Possibly as a result, one study found a correlation between number of flu shots and incidence of Alzheimer’s, a form of elderly dementia. The flu shot also contains “adjuvants,” substances intended to make a smaller dose of vaccine more potent, but which are often very dangerous in their own right. Why does the government not only permit, but even encourage, such elements? The stated rationale is that it allows a smaller amount of vaccine per shot, and the government is always worried that enough vaccine will not be available. But is this really a reason to inject children with formaldehyde? As we have noted, the major media are heavily supported by drug company advertising. For that or other reasons, “adverse events” reported after the flu shot by doctors are almost never mentioned in news reports. The responsible government agencies, primarily the Center for Disease Control, also ignore “adverse events” reported by doctors on the grounds that they are not “peer reviewed research,” but also refuse to do the research themselves. In an effort to shield vaccine makers from legal liability, the US government has set up a “vaccine court,” the National Vaccine Injury Compensation Program, funded by a 75-cent-per-shot tax on vaccines. It is by no means easy to get a payment from the program, but there have been payments for serious side effects of the flu shot, including Guillain-Barré Syndrome, acute demyelinating encephalomyelitis, encephalopathy, ventricular fibrillation and cardiac arrest, transverse myelitis, or some combination of these. Even when making these payments, the government routinely adds a disclaimer that “the Respondent (US government) denies injury/death was caused in fact by vaccination.” Since claims are only paid with substantial evidence, this disclaimer makes no sense. In 2011, the US government’s Center for Disease Control reported an increase in flu shot “adverse events” taking the form of “febrile seizures,” that is, convulsions accompanied by high fever in children,239 but did not choose to look further or modify its recommendations. Meanwhile the CDC’s Government Accountability Office report of the same year (cited earlier) noted the complaint of “stakeholders” (meaning drug companies) that the government was not promoting the shot enough, and that if more people could be talked into getting it, the makers would earn more reliable profits, and thus have more incentive to produce vaccine. Perhaps in response to this, the State of Colorado has ordered all health workers to get the shot or be fired.240 Other states and hospital systems have followed. Many health workers are very unhappy about this because they are more familiar with mercury-used-as-a-preservative and other issues. Thanks for posting this phenomenal expose’ — a much-needed antidote to the federal-Pharma onslaught. How long before the drones start shooting these deadly darts our way? In America we have a public health system that is so fouled up that we now bear the distinction of being first in all the industrialized nations in infant mortality. In nearly all statistical categories, including those pre-birth, the record is abysmal. And, once an infant makes it past the first year, it’s all downhill from there, with Autism, ADD, and chronic autoimmune diseases so prevalent that nearly 50% of the US population is on medication. The american medical dream. You have to be asleep to believe in it.